President Jacob Zuma respects the right of Members of Parliament to ask questions and make the Executive account, but this should be done in terms of the rules of engagement that exist in Parliament. President Zuma convened a Joint Sitting of the National Assembly, (NA) and the National Council of Provinces, (NCOP), on 12 February 2015, in order to deliver his State of the Nation Address (SONA) to Parliament. This was done in terms of section 84(2)(d) of the Constitution of the Republic of South Africa, 1996, read with Rule 7(1)(a) of the Joint Rules of Parliament. The Joint Sitting is chaired by the Presiding Officers of both the NA and the NCOP. The event was specifically aimed at the delivery of the SONA. Members of Parliament debate the speech afterwards, in this case on 17-18 February 2015, after which the President responds. The President respects the right of Members of Parliament to ask questions. Time is allocated for this purpose to enable the Executive to account. • Oral questions to the President in the National Assembly, four times a year. • Oral questions to the President in the NCOP once a year. • Written questions to the President on a regular basis. • Oral questions to the Deputy President fortnightly and written questions on a regular basis. • Oral and written questions to Ministers. • Budget votes of the Presidency and Ministers. • Annual address of the President to the NCOP in November followed by a debate. The Executive also accounts during special debates called to discuss certain matters of a national importance. The Presidency has given the National Assembly the date of the 11th of March for the President to answer oral questions. The NCOP date will also be confirmed soon after discussions. It is the view of the President that the intention of the political party that asked questions on the 12th was to deliberately disrupt proceedings for political reasons, as all parties will have an opportunity to raise issues during the debate and to ask questions on the 11th of March. The Parties can also send questions for written reply at any time. 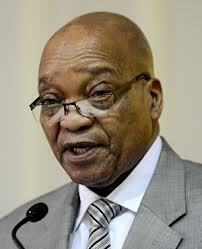 President Zuma also condemns the jamming of cellular phones in the National Assembly. Rumours that the President was informed of this act are incorrect and baseless.